If you're from Newcastle you will probably have noticed that lots of new restaurants have been popping up in the recently redeveloped Grey's Quarter in Eldon Square. 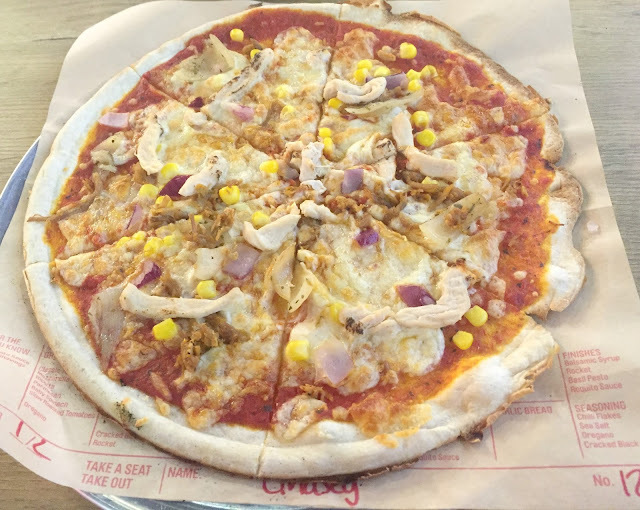 One of the new restaurants is Pizzastorm who create custom made pizzas in just 3 minutes! I think the best way to describe Pizzastorm is like Subway but for pizza instead of sandwiches. 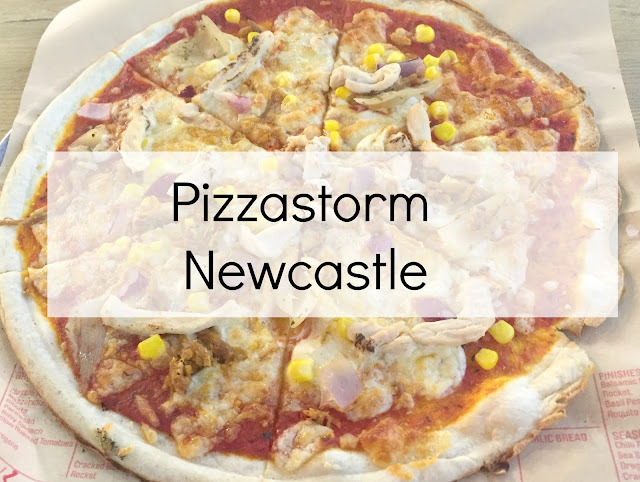 We were recently invited along to the very recently opened Pizzastorm which is located upstairs in Grey's Quarter to see what we thought. We visited on a weekday teatime at 4pm and the restaurant was not too busy with around half of the tables occupied. We were greeted by the friendly staff as soon as we entered and were asked if we had visited before, as we had never visited before we were talked through the process and it is actually really straightforward. All that Pizzastorm sell is pizza, there are no extra dishes and the only sides they offer are either Guacamole, a coleslaw shot or garlic bread. You can either create your own pizza, which I did or order one of the six 'Hall Of Flame' classic pizzas from their menu, such as margarita, This little piggy had BBQ or a Blazin Tornado - which is what the other half went for. I decide to create my own pizza and really make a pizza that I would enjoy, when you create your own you can add unlimited fresh toppings and they cost £8.45 no matter how many toppings you go for. 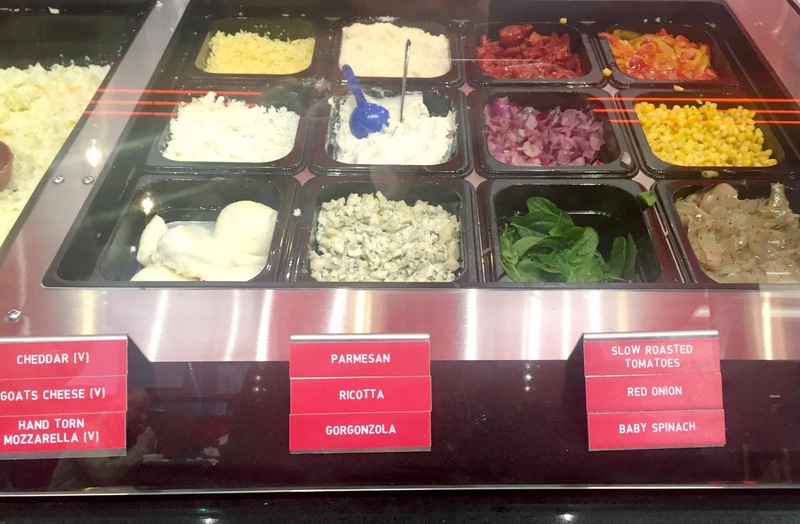 Creating your pizza is super simple and very much like Subway, all pizza bases are 11" Stone-Baked so when you join the queue you select your sauce first of all from the selection available, I opted for the classic tomato sauce for mine. You then move along the counter and select which cheese you would like, I stuck with Mozzarella, next you choose which veg you would like and you can have as many or as few as you wish. I went for onions and sweetcorn. The meat counter is next and again you select as much or as little as you want, I went for chargrilled chicken and BBQ pulled pork, you can then add any seasoning such as cracked black pepper, sea salt and chilli flakes. Lastly, you can add some finishes if you wish, things like Rocket, Basil Pesto and Balsamic syrup which I skipped. Once you have created your perfect pizza you then order your drinks and go and sit down while your pizza is cooked in the 900 degrees stone baked oven. Drink wise we ordered refillable sodas which were £2.75 each, you could also order water, cartons of kids juice, cans of beer or cider or even a bottle of wine. They also have ice cream for dessert with a choice of toppings and sauces. We then went and found a table and waited for our pizzas, when your pizza is ready they will shout your name (they write your name on your pizza when you order) and then you can tuck in and enjoy. You can help yourself to a selection of dips to enjoy with your pizza too, the BBQ one was yummy. Taste wise I really like the pizza that I created, the thin stone baked base was nice and crisp and the toppings tasted fresh and full of flavour. I am not really a pizza fan as I am not a fan of some of the toppings or thick deep pan bases, so the thin crispy base and the fact I could select my own toppings really appealed to me. 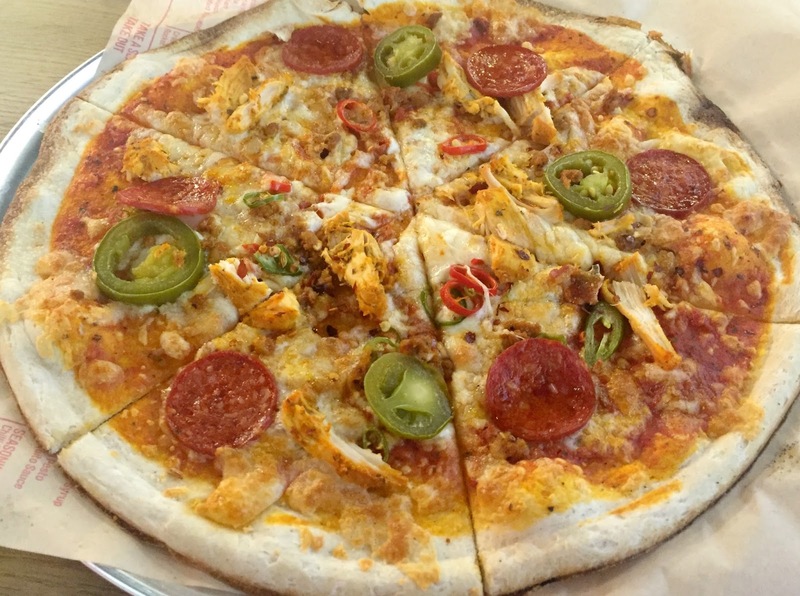 The other half had selected one of the 'Hall Of Flame' pizzas - The Blazin Tornado (£7.45) which consisted of Spicy tomato sauce, Mozzarella shavings, Spicy sausage, Pepperoni, Piri Piri Chicken, Jalapenos, Red & green chillies and Roquito sauce. While he did enjoy his pizza and said the flavours worked well together, he did say it was not as spicy as he was expecting. He also said that as it was an 11" thin stone baked base, it was not filling. So if you have a big appetite the pizzas probably won't fill you but I think they are great for a quick lunch or if you want something not too heavy to eat before a trip to the cinema or nearby theatre. Overall I did like Pizzastorm, I love the concept of customising your own pizza and that no matter how many toppings you select it will only cost you £8.45. The staff were really friendly and welcoming too especially Keeva (sorry if I have spelt it wrong), she is a real credit to the restaurant. I think that Pizzastorm is the perfect place to go if you want a quick lunch, it is somewhere that I know my teenage daughter would love to visit. A pizza and a refillable drink will set you back around £11 and they also offer a takeaway service if you don't want to eat in. Have you visited Pizzastorm yet? Disclosure I was provided with a complimentary meal for the purpose of this review, however all opinions are my own.